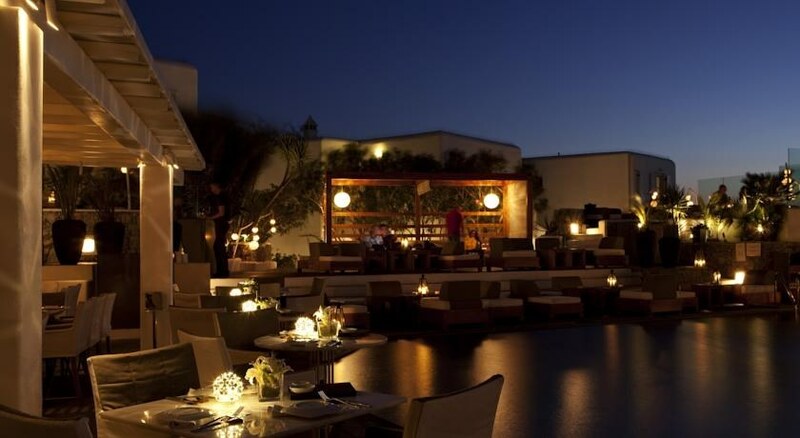 In the middle of Mykonos town, this hotel has become a meeting place for sophisticated, international audience, which places a premium on design, upscale nightlife and fine cuisine. Acts as head chef is none other than Nobu Matsushisa. 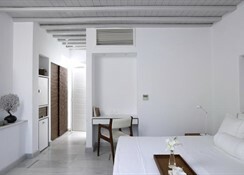 Location Located in the bustling city center of Choras, this boutique hotel has a wonderful retreat with wonderful views of Mykonos town and the harbor. Seven small, snow-white buildings surround the pool, from which open views of the typical Greek stone houses and the shimmering blue of the Aegean. Facilities The accommodation offers: 2 restaurants (open mid May-mid September, breakfast à la carte): Matsuhisa Mykonos (the only Nobu restaurant on the Greek islands, innovative Japanese cuisine and seafood), Belvedere Club (an exclusive restaurant with only 25 seats, modern Greek cuisin); Belvedere Bar, martini bar (in the evening with cocktails and dancing shows),Belvedere Cellar (250 selected wines), pool (heated) with a daybed, a pool concierge service, fitness facilities, Internet terminal and WLAN. Belvedere Spa Therapies with steam bath, Jacuzzi, Turkish bath. For a fee of treatments and massages. Rooms Rooms (43): At 7 buildings, white stone and wood dominate the interior. Classic Standard Room Garden View (approx. 20 sqm) with private bathroom, hair dryer, bathrobe, slippers, telephone, Wi-Fi, iPod docking station, LCD TV, DVD player, minibar, safe, air conditioning, dining area, bar trolley, balcony or terrace overlooking the garden. New Standard Room Garden View (approx. 23 sqm) garden, located on the ground floor with terrace. New Standard Room Pool-/Seaview (approx. 23 sqm) overlooking the pool (ground floor) or the sea (one floor). Superior Room Pool-/Seaview (approx. 26 sqm) is slightly more spacious, with dining and lounge area, terrace. 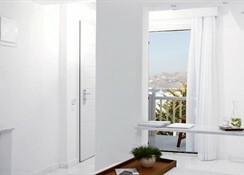 Junior Suite Garden View (40 sqm) with separate living and bedroom, balcony and terrace overlooking the garden. Junior Suite Pool-/Seaview (approx. 40 sqm) overlooking the pool or the sea. Meals Continental Breakfast. Payments All major credit cards are accepted.